In June 1978, Seymour Ivan Rubenstein (b. 1934), director of marketing for IMS Associates Inc. (a California based computer manufacturer, which designed the IMSAI computer), left the company with $8500 in cash and established his own software company, named MicroPro International Inc, one of the first software companies. 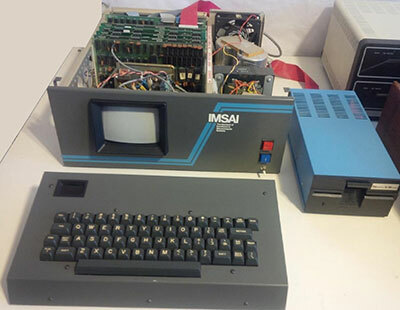 Soon he hired another IMSAI employee, the chief programmer John Robbins (Rob) Barnaby, to wrote an editor and a sorting program for data processing. Rob Barnaby aimed for scientific career entering Harvard College in 1961, but eventually realized he was an engineer, not a scientist, by personality. During his senior year, he stumbled onto computer programming, which became his employment career. He got his B.A, degree in Physics in 1966, and started in Bolt Beranek and Newman (BBN), where he worked until 1971, then he moved from Cambridge MA to California. Barnaby already had an experience in the area of text processing, as while at IMSAI, he wrote a screen editor (called NED, New EDitor), so within a few months, in late September 1978, the commission of Rubenstein was fulfilled. The editor was called WordMaster, and the sorting program was called SuperSort. The programs were created on IMSAI PCS 80/30 computer (see the lower image) with IMDOS operating system (a version of CP/M OS), and were entirely written in assembly language of Intel 8080. WordMaster was a simple text editor with no print formatting capabilities, and completed with a formatting program called TexWriter, formed MicroPro's main sales until April 1979. Following the completion of WordMaster and SuperSort, in October 1978 Rob Barnaby set to work on Rubinstein's new word processor that was to become WordStar. The idea for WordStar Rubinstein got when he studied the Datapro reports, that discussed the abilities of contemporary standalone word processors from Lanier, IBM, Xerox, Wang, and others, and he asked Barnaby to enhance WordMaster with similar features. Barnaby recalled later: Seymour was the marketing brains—it was he that said we should address word processing to get a larger market. The defining change was to add margins and word wrap. Additional changes included getting rid of command mode and adding a print function. I was the technical brains—I figured out how to do it, and did it, and documented it. The product's success I think related both to it being the right product (Seymour) and to it being a fairly good implementation given the equipment (me). Barnaby needed four months to code Wordstar on his IMSAI PCS 80/30 computer. This was done in assembler for Intel 8080 from scratch (according to Rubenstein Barnaby was the mad genius of assembly language coding), as Barnaby wrote 137000 lines of bullet-proof assembly language code. Only some 10-percent of Wordmaster code was used. 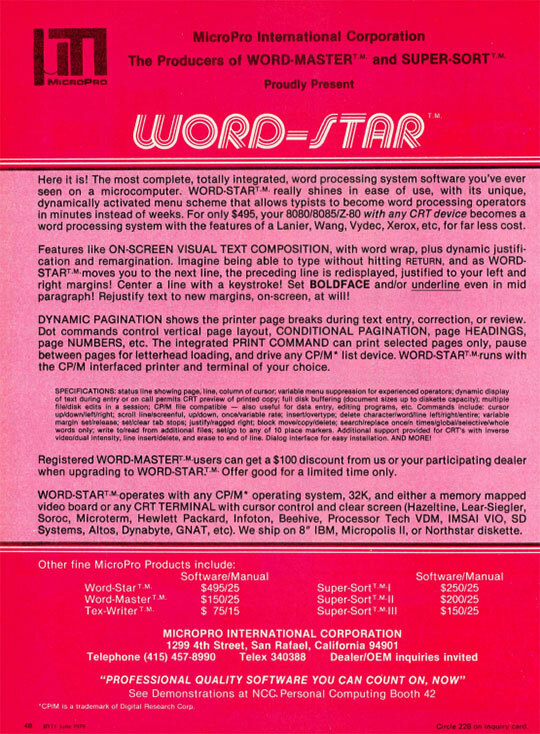 In June 1979, MicroPro began selling the product under the name WordStar. The price was $495 (and $25 for the manual), and by early 1980, MicroPro announced that 5000 people had purchased WordStar in eight months, a very good marketing success for the time. Wordstar was the first microcomputer word processor to offer mail merge and WYSIWYG. It was the first editor with dynamic pagination and even help levels among other new features. Barnaby had been working extremely long hours and was burnt out. He stopped direct work on the program, first acting as an advisor and then taking a long overdue holiday. 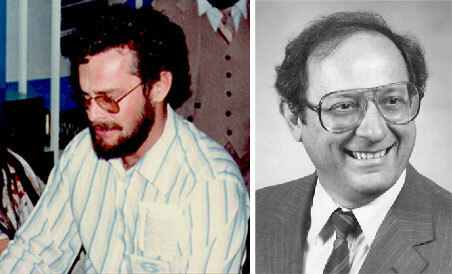 Finally he left MicroPro in March, 1980, but returned for several weeks again some time later, when Rubenstein asked him to wrote a customized ROM version of WordStar for the first portable computer of Epson, PX-8. Wordstar soon became a true blockbuster. In 1979 Micropro did half a million USD sales, which jumped to $1.8 million in 1980, and to $5.2 million in 1981. Then the company ported the product for CP/M-86 and PC-DOS (Jim Fox, Barnaby's assistant, ported WordStar to MS/PC DOS) and released it for the IBM PC in April 1982 and sales sky-rocketed to $23 million, to reach $45 million in 1983. In 1984, just as the company was going public, the sales were up to $70 million, and users of Wordstar were over 1 million. Micropro became the biggest software company in the USA. Interestingly, in late 1980s Rubinstein was sued by Bill Millard, former CEO of IMSAI, regarding theft of trade secrets regarding WordStar, but Rubinstein managed to defend successfully. Rubenstein later developed a spreadsheet product called Surpass, which became the famous Quattro Pro.